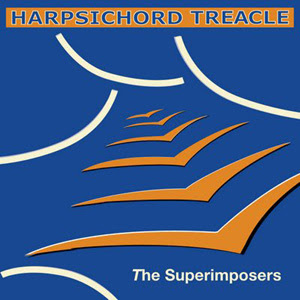 On a recent stroll around the internet, I bumped into these guys, The Superimposers and their long awaited third album release Harpsichord Treacle. The Superimposers are Dan Warden and Miles Copeland, a London based duo (not American as I originally thought). If you haven't heard The Superimposers before, I'd describe them as The Beach Boys meets The Beatles meets Air meets something in 1950's America-there are a lot of other hints and flavours in their songs but I can't quite put my finger on them yet. If any of those artists just mentioned interest you at all, this is an album worth a listen. The track that stands out for me is Autumn Falls (it's on their myspace site if you want a listen). I think it has a hint of Crowded House (vocals) meets the Beach Boys (melodies). I can imagine sitting in the window of a diner on the coast in Southern Oregon on an Autumn day looking out over the rugged sea sipping a hot chocolate listening to this track-but that's just me! I can't listen to this kind of music for too long, I find myself needing to resort to more punchier music to balance things out but while I take in a couple of songs at a time, The Superimposers do capture my imagination. Rough Trade championed this album in their featured artists Album Club for January and it is currently available for purchase exclusively from their site. Not a bad endorsement. PS Maybe you'll get a chance to sit in that diner in Oregon. I'm based in London so the chances for me are small. This track from The Superimposers is called Heavy Sigh of their last album. This is a tune!